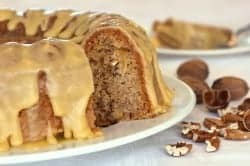 Home » Bread Recipes » Spiced Apple Cake – this is a wonderful cake to make in the fall, or anytime you have apples around. Spiced Apple Cake – this is a wonderful cake to make in the fall, or anytime you have apples around. Growing up late September and fall meant apples, lots of apples, applesauce, apple bread, and yes spiced apple cake. This is from the archives of my grandmother, Ethel Eynard. Jefferson City, MO. 1988. This is a wonderful cake to make in the fall, or anytime you have apples around. Cream butter, sugar, and eggs in a large bowl. Sift flour with baking soda, salt, cinnamon and nutmeg. Add to creamed mixture stir in apples, raisins, and nuts. Pour into a greased and lightly floured large bunt pan. Bake in preheated 325 degree oven for 1 hour. Drizzle with icing, if desired. This has been updated. I apologize for leaving it off! My family loves this cake. I found put a brown sugar icing on it and it was fantastic. Thank you for the recipe. do you have a recipe for the icing shown on this cake? it looks wonderful!